The back and sides of this hairstyle is tapered into the head with jagged cut layers through the top, which is styled under for a chic look and feel. The bangs are swept to the side to soften the face and completes the over-all 'do brilliantly. Product is needed to keep this hairstyle is in place. 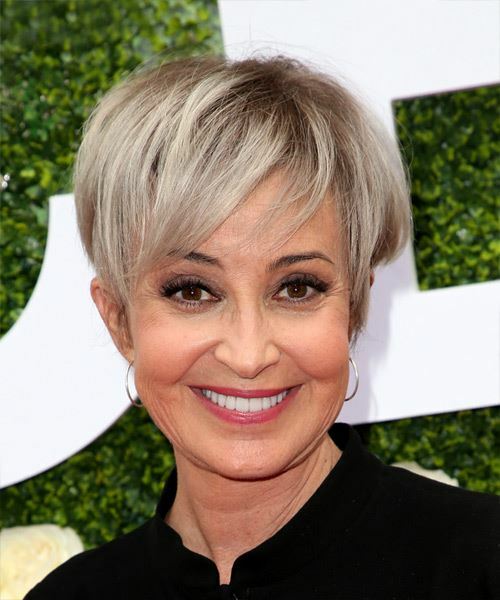 Annie Potts looks chic and stylish here in a layered short hairstyle. Annie suits short hair well due to her oblong face shape, expressive eyes and high cheekbones. She also looks best in styles with side swept bangs thanks to her high forehead. The tapered sides and back in this cut show off her face nicely, while the longer layers at the front give her some forehead coverage and bring the focus up to her eyes. This â€˜do works well with her hair type, which is fine and straight, as it can be blow-dried to add volume and shape. As for her color, Annie has a fair, cool complexion, dark eyes and naturally auburn hair. Here she goes for a cool silvery grey tone that brings out her eyes and expressive smile. This look gives Annie's 'do a trendy edge while working with her naturally greying hair color. This cut and color embraces her age while still looking trendy and fun! Anne Hampton "Annie" Potts is an American film, television and stage actress. 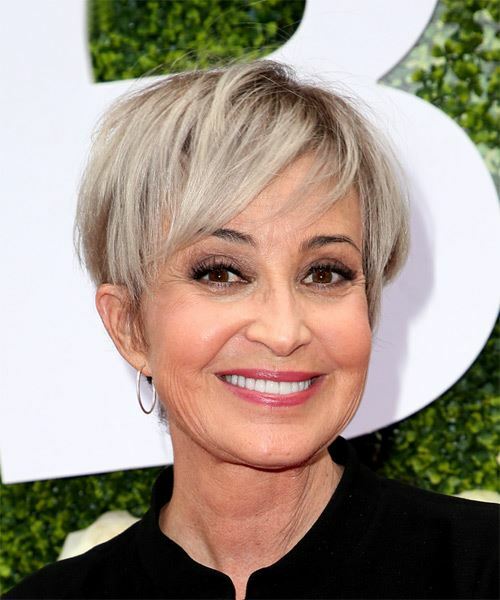 She is known for her roles in popular 1980s films such as Ghostbusters, Ghostbusters II, Pretty in Pink, Jumpin' Jack Flash and Who's Harry Crumb? Use a round brush to add volume at the roots and blow-wave the ends under.